New Delhi, March 18: A few days before the festival of Holi, the Confederation of All India Traders (CAIT) have called upon the shopkeepers to boycott Chinese goods. The call to boycott Chinese goods has been made to more than 40,000 trade bodies across India. There are more than seven crore members/traders part of the association. The decision by traders comes after China blocking the listing of Masood Azhar as global terrorist in the United Nations (UN). #BoycottChineseProducts Trends on Twitter After China Refuses to Back Declaration of Masood Azhar as Global Terrorist at UNSC. China's decision to block the proposal at the UN to enlist Jaish-e-Mohammed (JeM) chief Masood Azhar as a global terrorist drew ire and criticism from Indians across the globe. 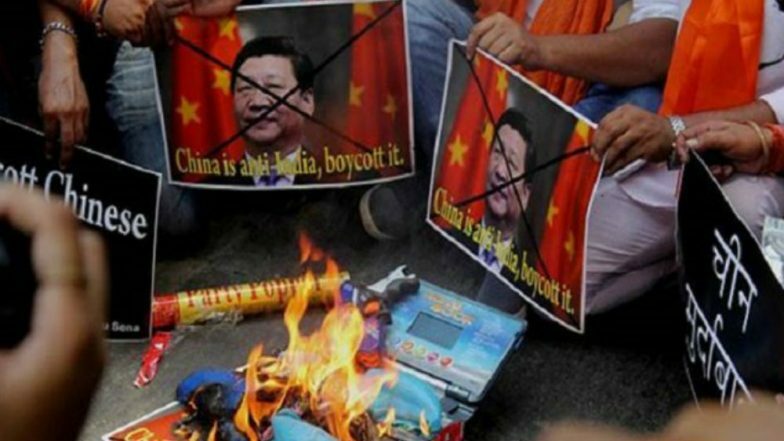 A large number of Indians took to Twitter demanding a boycott on Chinese goods. People on social media stated that there should be a complete ban on Chinese goods being sold in Indian markets. #BoycottPaytm: Alibaba Funded Paytm Receives Flak After China Shields Masood Azhar, Netizens Call for Boycott of Payment App. CAIT has also called for the burning of the Chinese goods on March 19, Tuesday. The burning of the Chinese goods will be conducted at around 1,500 centres across the country. The traders’ body has also demanded the Government to levy 300% to 500% custom duty on imports from China. CAIT asked the government to provide special package to small and medium term industries and reduce the import of Chinese raw materials and goods. “Imports from China poses some important questions which include what all is imported is in fact necessary for the economic development, whether the Government is getting legitimate revenue on imports, whether imports are linked with hawala transactions, whether money paid to exporters of China are being used to fund terrorism activities,” said a statement by the traders' body.